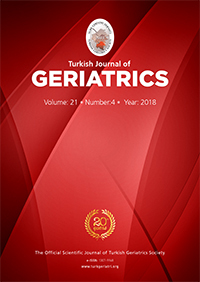 2Başkent University, Faculty of Medicine, Department of Public Health, Ankara, Turkey DOI : 10.31086/tjgeri.2018.61 Introduction: Polypharmacy is common among the elderly. This study aimed to determine the frequency of polypharmacy and the risk factors in the elderly. Materials and Method: This cross-sectional study will be analysed in three stages (polypharmacy, drug characteristics and drug interaction). Herein, the first stage (polypharmacy) was conducted at Burdur city centre and the connected villages. A total of 400 of 11,360 subjects aged ?65 years who were registered with family physicians in Burdur city centre were selected using a systematic sampling method. A questionnaire of 30 questions about socio-demographic variables and rational drug use was distributed among the subjects. Subsequently, the subjects were asked to bring their own drugs from home that they were actively using or not currently using, and their drug-using behaviour was analysed via specific questions. Results: The average number of different drugs possessed by the subjects at home was approximately 6 (5.95±4.30). A total of 64.9% of the drugs were used regularly, 21.3% were used occasionally and 13.8% were previously used but not currently used. The median number±standard deviation of the drugs that were used regularly, used occasionally and previously used but not currently used was 3.86±3.36, 1.27±1.75 and 0.82±1.82, respectively. According to the results of multivariate analysis, the presence of diabetes, hypertension, respiratory system or cardiovascular (except hypertension) diseases, visual impairment or hearing disorders significantly increased the total drug use (p<0.05).